Only one feature is already clear: the new ship will have to be able to generate enormous amounts of electricity, for example to power the (probable) electromagnetic catapults as well as future laser weapons, which points to nuclear propulsion. 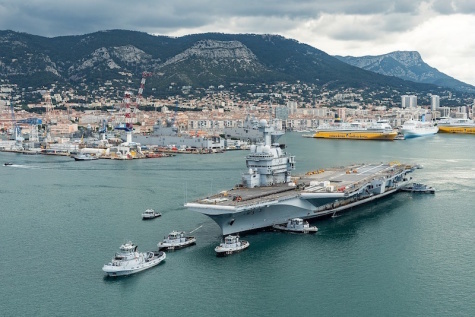 In addition to initial studies of the new carrier, Parly announced several significant equipment decisions that, added to equipment ordered under the previous multiyear program law, will provide the French Navy with €12 billions’ worth of investment in naval capabilities over the next six years. In 2019, the French Navy will take delivery of two BASH offshore support ships, one FREMM frigate, one Antilles light patrol boat, one B2M offshore patrol vessel, two upgraded Atlantique 2 maritime patrol aircraft and two NH90 helicopters. Parly also announced at Euronaval that France will build four new fleet oilers, as part of a program with Italy dubbed FlotLog and based on the design of Vulcano, the Italian Navy’s new fleet oiler now being built by Fincantieri. “On the bases of an Italian design, Naval Group and the Chantiers de l’Atlantique shipyards will renew our fleet of logistic support ships, the first two of which will be delivered by 2025. “I believe that France and Italy have a lot of things we can do together in the field of naval industry. My friend and Italian counterpart, Elisabetta Trenta, will be in Paris tonight and I think we’ll have several things to announce,” Parly said. Another future program announced at Euronaval is the Système de Lutte Anti-Mine du Futur, or future minehunting system. This will comprise a mother ship and unmanned surface and unmanned underwater vehicles. Parly said France would order four such systems, which will be delivered by 2025. They will benefit from the joint initial studies with the United Kingdom, but it is not clear whether this will be a joint program or not. In addition, France will also order two light minehunters and three minehunting diver vessels. Despite Parly’s depiction of a strong commitment to European cooperation, most of France’s investments in future naval capabilities will remain on a national basis. This is obviously the case for nuclear submarines, which is a component of national sovereignty. The first four Barracuda-class nuclear-powered attack submarines will be delivered, and the final two ordered, by 2025. They will replace the Rubis-class boats currently in service, and will be armed with the Missile de Croisière Naval naval cruise missile. Initial studies will also be launched “in the coming years” for the third-generation ballistic missile submarine, and the upgraded M51 submarine-launched ballistic missile. The French Navy will also continue to modernize its surface combatant fleet. The final three FREMM frigates, two of them in the FREDA anti-air configuration, will be delivered by 2022, while the first two Frégates de Taille Intermédiaire (FTI) intermediate-size frigate will be delivered before 2025, and another three ordered. These ships will be reinforced by three La Fayette light frigates, which are to be upgraded under a program also intended to extend their service life. The maritime patrol component will also be upgraded with 18 Dassault Atlantique 2 patrol aircraft – three more than previously planned – while another seven maritime surveillance aircraft, based on Dassault Falcon business jets, will be ordered in 2020, with an option for six more to be taken up in 2025, for a total of 13. The first three will be delivered by 2025, with the other six to follow between 2026 and 2030. -- What will be the specifications of the new carrier, on the technological state-of-the-art in 2030. Its propulsion – conventional or nuclear – is still open, but it will have to take account of new technologies like, for example, electromagnetic aircraft catapults. The Minister of the Armed Forces, Florence Parly, officially launched the renewal program of our aircraft carrier at the Euronaval show in Le Bourget on 23 October. The Euronaval trade show is the world forum for the naval defense technologies of the future. This 26th edition will be held from 23 to 26 October 2018 at the Paris - Le Bourget exhibition center. This year, nearly 470 exhibitors from 33 nations, 129 French and foreign delegations, 20 Chiefs of Staff of Marine and 5 Ministers and Deputy Ministers of Defense are present at this great event. At the inauguration of the show, the Minister of the Armed Forces, Florence Parly, recalled the commitment of the Government to return to the defense [ministry] the full means of its action. "By planning to invest 295 billion euros for our defense by 2025, the Military Program Law 2019-2025 (LPM) allows us to move towards our goal of devoting 2% of our national wealth to defense." The LPM gives France the means of its naval defense by continuing and accelerating the pace of programs launched as well as by filling the capability gaps. To guarantee the autonomy of deployed forces and therefore our full sovereignty, the LPM will make it possible to have, among other things, four new generation tanker tankers. This program, named FLOTLOG (Logistic Fleet), will be conducted in cooperation with Italy. The ships will be based on an Italian design, but under contract with the French manufacturer. "Naval Group and Chantiers de l'Atlantique will be able to renew our fleet of tanker tankers and the first two will be delivered before 2025". "We must also prepare for the future of our naval aviation group, which is a strategic capability of our national defense and the Navy, an efficient and effective capability that we must maintain and renew," Florence Parly said. The minister also announced the launch of France's future aircraft carrier program. After an upgrade, the only aircraft carrier in France, the "Charles de Gaulle", will be able to return to operations in the first quarter of 2019. But she will end her service life beyond 2030, and will need a successor. To that end, the minister has launched the renewal program for our aircraft carrier. "This initial step, which begins today, is the study phase, which is to determine together what we want and how we want it for our future aircraft carrier." This 18-month study phase will establish the architecture of the future aircraft carrier and lay the foundations for the industrial organization needed to build it on time and on cost. These studies will also determine the number of units that France and Europe will ultimately need. "Do not put the cart before the horse, the time is now to design, not yet to determine how many ships are needed." In addition, starting in 2019, two offshore support and assistance vessels, a multimission frigate, a West Indian light patrol boat, a multi-mission building, two renovated Atlantic 2s and two NH90 helicopters will be delivered to the Navy.